As a reminder, or for those who haven’t been following the blog regularly, we’ve now owned a Nissan Leaf for 4.5 years and an electric cargo bike (Xtracycle Edgerunner) for 3 years, and just recently took the last step to becoming an “EV-only” family by replacing a 2011 Subaru Forester. In this post I’ll share what we bought, and some of the reasons for our choice. Drum roll please…. If you hadn’t guessed correctly yet (and some of you did, even noticing a recent change in my PlugShare profile when I signed into a charger haha), we bought a Tesla Model 3! Tesla is the only company 100% dedicated to producing EVs (at least in North America, NIO recently started up in China and is doing well so far). They are not trying to protect their other petrol version cars by releasing EVs with odd choices (e.g. no power seats on Leaf and Bolt, weird doors on the BMW i3, no cargo room in the Toyota Prius PRIME, no AWD on the Hyundai Kona EV even though the gas car has it…). Their sole goal is to “accelerate the advent of sustainable transportation” – they are consistent in all of their messaging in this regard, and I feel they absolutely mean it! And it is driven from the top, by their CEO, Elon Musk: check out this segment from about 1:30 to about 3:25. Also take a look at their “Secret Master Plan” and “Master Plan Part Deux” – as the name implies, these are the master plans for Tesla… and they have now finished delivering on the first one! Tesla vehicles score the highest on safety out of any vehicles on the road right now. The most dangerous thing I do is commute to work each day on the highway, so this was a big consideration – if they scored poorly, I wouldn’t have bought one, no matter how cool they were otherwise (incidentally, the Leaf does score poorly on the relatively new IIHS Small Overlap test… one of the reasons I wanted to retire it from the highway). They treat EVs as part of a larger ecosystem; they do the obvious design & manufacture of the cars, but they do so in a way that works well with the rest of their system, which includes: direct sales and service (no dealer salespeople hassling you), over-the-air (OTA) software updates (yes, your can get better over time rather than slide into obsolescence), the aforementioned Supercharger network, Powerwall home battery systems, and solar panels (or solar tiles) for your roof! With the success of Model 3, I now feel that Tesla will be a going concern for the foreseeable future. This makes me more confident in buying one of their cars, knowing that it will be supported as long as I own it. Why the Model 3 Specifically? I actually started my search for a 2nd EV in early 2018 thinking I would buy either a Kia Niro EV or an Audi e-tron quattro. I’ve been watching Tesla since the days when they were trying to get the Roadster production going (almost 10 years now), so I’ve been pretty interested in the Model S for some time now; the problem had always been price – if I recall correctly, the cheapest price for a Model S was around $80 – 85k, back when the $CDN was almost at par with the USD. So when the Model 3 was announced in March 2016, I was pretty excited… until I learned it was a sedan (i.e. has a trunk)… I’ve owned only exactly 1 car with a trunk and didn’t like it – everything else has been a hatchback or wagon. Both Kia and Hyundai have only been making “compliance cars” thus far – meaning that they produce EVs in just sufficient quantities to satisfy the California Air Resources Board (CARB) rules that mandate a certain amount of ZEV credits be either earned by selling qualifying EVs and PHEVs, or by buying excess credits from other manufacturers. Quantities for the Niro (and Kona) have been announced, and they are essentially still compliance cars, with no serious effort to build up production in sight. This may mean support headaches down the road, and a long wait list to even get one (especially if you are outside of any CARB jurisdictions, which by the way, Quebec is now a de facto part of with their ZEV mandate). While the Niro is capable of a slightly faster charging speed then the Leaf (up to 70 kW instead of 47 kW), there aren’t any chargers in BC that are capable of delivering that rate yet. And it is still ultimately slower than any Tesla on a road-trip, even accounting for differences in driving efficiency (e.g. it is more efficient than the Model S, but total road-trip time is still better for the S). Couple the above with the relative dearth of DCFC charging/availability at this point, and any Tesla is a sure winner for road trips. I really wanted a vehicle that would largely replace the Forester and still serve well as my daily commuter. After distilling our use cases that needed to be filled (after accounting for what the Leaf can already do: local commuting, “utility/dirty” jobs, mountain bike shuttle up Giveout Creek FSR), we were left with long daily commuting, road trips (skiing, BMX/MTB trips, ‘regular’ road trips), launching/retrieving our sailboat, and farther away trips to rougher forest service roads (FSR). I put together a scoring matrix, with weighting on how often we do different things and availability of alternatives, and ranked the Niro EV, e-tron quattro, used Model S, and Model 3. The e-tron quattro scored highest everywhere except for road trips, where the charging network and speed meant the Model S won (it also hauls more cargo than the Audi believe it or not!). 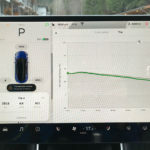 But since money has to be part of the consideration, I took a closer look at alternatives and added money into the weighting (Model 3 will pay for itself over about 5 – 6 years instead of keeping the Forester and commuting in it). After all this, the Model 3 came out on top! Model 3 (long range) won anyways for local commuting; at a minimum it can do my round-trip twice to work and back for several years to come (this is helpful to stagger availability of our one charger between two cars – and we can’t install a second one) – none of the other cars could do this; and it is the cheapest to operate to boot (most efficient). The big “ah ha” moment was when I started looking into road trips. 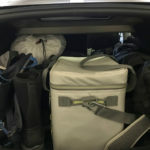 The primary concern here with a family of 4 and lots of outdoor gear was cargo space availability – so it needs to be able to have a rack for a roof box (Model 3 checkmark) and a hitch for the bike rack (check again), plus sufficient cargo room in the vehicle itself – hmmm, a sedan? Well, we had taken the Leaf on a few road trips already, and while it was a tight squeeze, we had managed. The Model 3 was rated for lower cargo room then the Leaf though, which would be a problem unless you put on a huge roof box. BUT, when I dug into it after seeing a Model 3 locally (thanks Mike!) and thinking the trunk looked at least as big, it turns out that Nissan has been over-reporting the cargo capacity of the Leaf badly in North America for years! The reported value is 660 L, and the actual measured value is closer to 375 L! Big discrepancy, and explains why the hatch of the Leaf looked so similar to the Bolt when I compared it in 2016 (at the time, I thought GM had under-reported capacity of about 375 L…) For comparison, our Forester has 770 L and has been full on previous bike + camping trips. 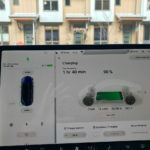 Tesla reports the Model 3 at 340 L for the trunk only – actual measurements show it to be closer to 450 L, and once you add in the “hidden” storage (under the rear trunk floor 80L, plus frunk 85L, plus another 50-75L for soft fluffy stuff like pillows/sleeping bags on the rear glass parcel shelf) you are closer to 650 – 700 L! If we buy a bit bigger roof box than we own already (a Yakima Rocketbox 11), we could have “dry” cargo capacity similar to the Forester. Now add in the much better efficiency of a Model 3 over an S and it will have faster road-trip times even! Launching/retrieving sailboat – well, we only do this twice per year, since our boat lives on a mooring. We plan to rent or borrow a friend’s truck… but I’m betting our Model 3 will work fine, since it has more than enough power (335 hp, 300 ft-lb torque) and is rear-wheel drive. I included the cost of renting in my economics calculation. 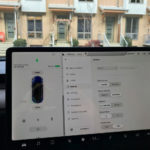 Further away FSR trips – actually most FSRs are relatively well maintained, so I’d entertain the idea of bringing the Model 3 on a gravel road (e.g. to head into Lussier Hot Springs in the east Kootenays) – but we can also rent a vehicle for that, and we are only doing this on average once per year at this point in our lives (with majority of the kid & family activities we do now, we are largely paved road warriors). So in a very long-winded fashion, that’s why we bought a Model 3! 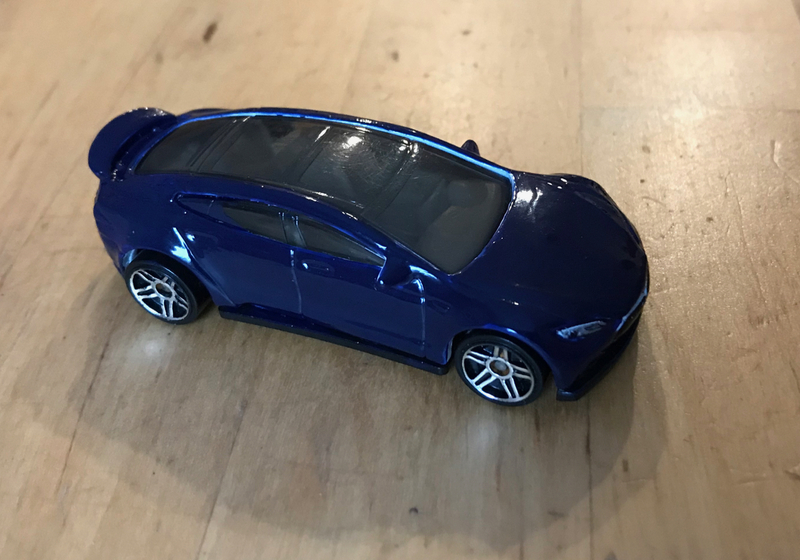 Congratulations if you made it to the end of this post – here’s a sweet picture of a Hotwheels Model S that my family painted blue and gave me for Christmas (thinking my car wouldn’t get here by Christmas lol)! If after all this you are swayed to buy a Tesla, please consider using my store referral link to order: https://ts.la/andrew71174, or give the code “andrew71174” to your Sales Advisor during your purchase. Generally you will get some kind of benefit. What do I even do with this much range?! Lots more to come as I get to the know the car, test various features and put it through more paces than a typical owner would do! Congratulation Andrew and Family. Have a Prosperous New Year. I enjoyed your last flurry of posts. I was certainly doing mental gymnastics in guessing what your choice was. I was both surprised, and not surprised. I thought M3 was a high contender but wasn’t sure if the lack of a hatch back and clearance would steer you to something like a Etron or Niro/Kona. Certainly the Bolt is too small to replace the Forrester. Etron is an intriguing option- I very much agree and cheaper than a model S/X but certainly still silly expensive and, unavailable like the Niro/Kona. I wasn’t aware the Niro/Kona would be not have AWD- unfortunate but make some sense. I am surprised you went for a sedan though and thought you might be able to stretch to an X for the utility. It is always super interesting to understand which compromises people make and for what reasons. Thanks for sharing so many details. Ahhh, looking at the most recent supercharger map I see Hwy3 is slated for 3 or 4 convenient superchargers sometime in 2019. Yes as you noted, Highway 3 will get Superchargers in 2019 (optimistically, 2020 more likely). 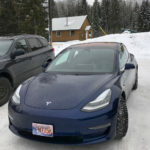 The long range 3 will make it to Kelowna without too much fuss though, even in winter, according to ABRP, so I expect going west will not be a big deal. Heading east, Fernie is slated to get the first SC on Hwy 3, and it will make linking to AB easy. I can also get to Golden in one shot in most weather. And whenever we go to the east Kootenays, it is a “destination”-type trip, so we’ll charge at whatever campground or hotel we are staying at. As far as the X goes… I have always been very conflicted on that car. The extra clearance, dedicated towing ability etc has always been welcomed, but I hate those rear doors. I don’t like having skis in the car, and I think they may be expensive to fix in the future. As far as RWD vs AWD… I would have liked it, but it simply came down to money – had to prioritize! 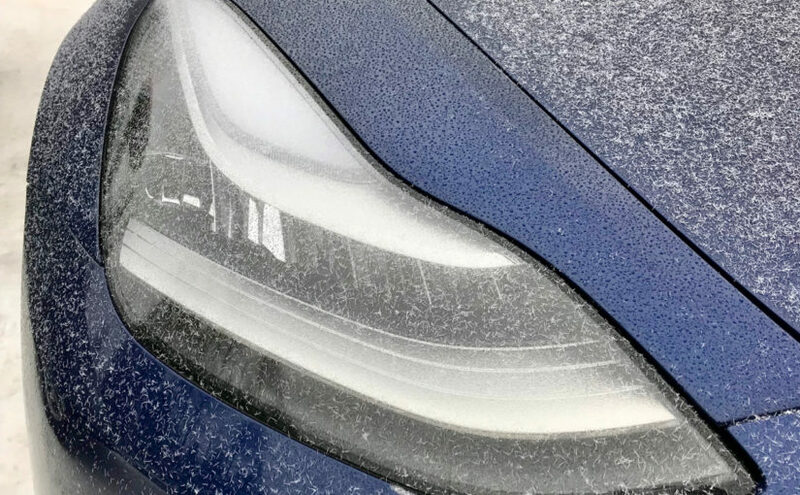 We’ve managed 5 winters with a front-wheel drive Leaf, so I figured the RWD Model 3 would be similar (or possibly better). So far it seems better. Good to hear from you David, hope all is well with you and your family – happy holidays! Well, I don’t think there will ever be so much as a moment when you second guess your decision! I’m about to turn 100,000 in my S any day now and while there have been a few glitches here and there, none were significant enough to make me reconsider. And the fit/finish/reliability has improved since I bought mine almost 4 years ago, so you *should* be even happier! As far as not being able to charge at the same time… consider a couple of the current model Wall Connectors. You can ‘network’ up to 4 (at least?) together to share a single circuit. And with a JDapter stub or equivalent, you can charge the Leaf from the Wall Connector at the same time as the 3. If you have a 50 amp breaker (for example) you can pull pull 40 amps continuous by Code. The 3 would pull all of it until you plug in the Leaf… at that point the WC’s agree to provide 20 amps to each vehicle until one or the other is finished… at which time the current on the unit still in use will bump back up. I’ve been doing this with the S and i3 with no issues. It would take a crazy day of use on both cars to not be able to get both charged overnight. Oddly enough, Tesla makes the Wall Connector with a J1772 plug on it… but you can’t buy it! They use them with the Destination Charging program, to provide a location with both Tesla and J1772 charging capability. With the load balancing ability, it would make sense for them to begin selling the J1772 variant as well for customers like you, but they apparently aren’t in the EVSE business! I’m looking forward to the expansion of the Supercharger network to the Hwy 3 corridor… but I’m not holding my breath. Teslatime is a real thing…. However, I can’t believe they won’t eventually enable CHAdeMO (or CCS) compatibility in the 3 like they have done CHAdeMO in the S and X with their adapter. I carry the CHAdeMO adapter with me all the time and have used it more than once! 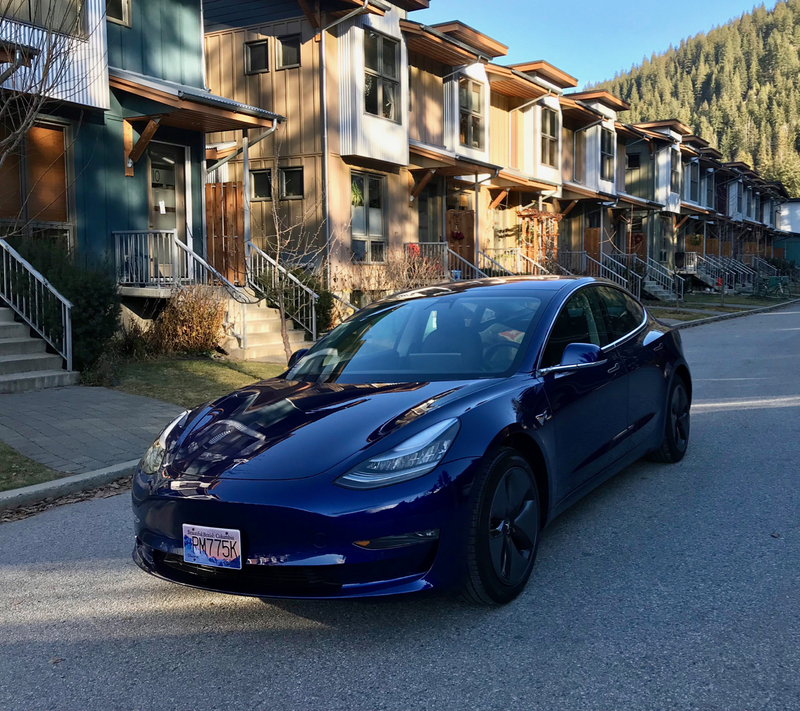 Welcome to the Tesla Family and consider joining the BC club…. 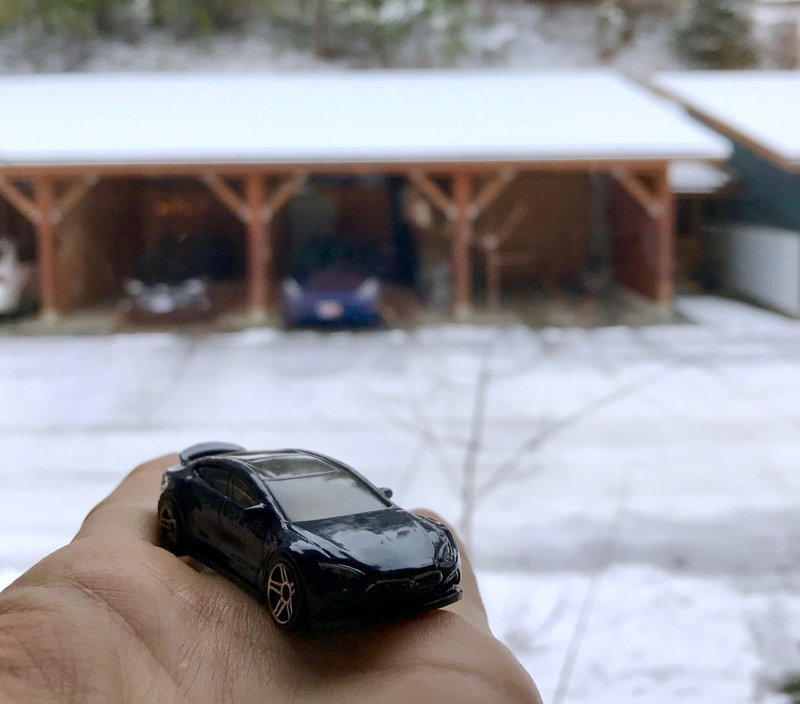 bc.teslaownersclub.ca! I really think in 2019 we will get an announcement about either CHAdeMO or CCS for the Model 3, along with perhaps an upgrade to dual-cable SCs ala Europe. I haven’t decided what the strategy is with CCS in Europe. The 3 hasn’t been opened up to allow CHAdeMO with the Tesla adapter (that works with S and X) here and I don’t know why. My suspicion is that they’re concerned by the bad press they’d get if every new 3 owner decided to use the nearest CHAdeMO station instead of home or a supercharger stop. The folks driving cars limited to CHAdeMO would be ticked right off I think… and the us vs. them battle would begin. Tesla has always used a different connector in Europe… the Mennekes… likely due to the fact that three phase power is so common there. They beefed it up to handle supercharging power levels, but I wonder if there is an inherent limitation in the design (compared to our design in N.A.) that will prevent it from working well with future supercharger versions (higher power versions). CCS might be a better route for them and they’re adapting to that now. Which just begs the question, why are we not moving to CCS as well? Putting the trailer hitch on was a fun adventure but totally worth it. Have you chosen one and installed it? The only model I’m aware of is the Ecohitch from Torklift. Hey Peter, I’m holding out for a few more months in case Tesla decides to homologate the Model 3 for towing in the EU (in which case they might also offer a factory hitch in North America too). If they don’t release one by about April, I’ll be buying the Ecohitch from Torklift Central too. It does look like a bit of a daunting process – did you need/have helpers? It was just my ten-year old and me. Gathering the right tools ahead of time is key. The metric sockets are standard, but a long torx 25 driver, the hole saw, and the 15/16 ratchet wrench (not a socket) are key. Thanks for those extra tips! Did the instructions from Torklift lay out all of this, or was some of it trial and error? I pulled together a couple of posts from the forums on teslamotorsclub.com to build the tool list, but the best source of information was the video of the process on Torklift’s website. It actually went smoothly with almost no trial and no irreversible errors, but it took over three hours of solid work. The hardest parts were dealing with the two torx fasteners (awkward location and tough to line up the holes) and the electrical connectors (there is a way to disconnect them without forcing them, but it took a bit to figure out). It would have been easier with a lift but I was able to do it on the ground by driving the rear wheels up on some blocks of wood to gain a few extra inches of clearance. A second person is only essential for a few steps, but good to have for the rest of it too just to keep you from missing steps and to help figure out a few of the tricky bits. If there’s a way I can contact you privately I would be happy to give you my contact information. When I was in the Kootenays two summers ago I considered looking you up since I had been following the blog, but elected not to at the time. – Similar experiences as peter. Great to have now. Using an (expensive) 4-bike 1Up hitch – but for convenience its worth every $. Anyways, thanks for your great site. Congratulations on the new car – Excellent choice. I, too, am keen to see the new superchargers coming in southern BC. I’vefoll Your blogs since your first report. This, as alwYs has excellent information. Wow! I take a few days off email over the holidays, and look what Andrew does! Congratulations! Read your whole rationale and can’t fault it 😉 The big thing you have going for your calcs is of course your long daily commute. I’d have to do a lot of “massaging of data” to get a Model 3 to pay for itself, compared to the Prius C puttering around town… Oh well, I will be watching you tube videos of Model 3 tests in the bakery over the next few days. Thanks for that vicarious thrill! Oh, and I look forward to seeing Lazuli “in person”… Happy travels in 2019! Those SylvanSport trailers are really nice, but not cheap! I’m also curious about whether anyone has figured out how to tie-in to the wiring harness to get the turn signals and brake lights working on the trailer. I’m sure a little googling will reveal someone who’s already done it. I like the “Go Easy”, which is just a fancy small cargo trailer (but you can stand it up on end, which would be handy for our very limited parking situation. I also like the aluminum construction and design for adding “roof” attachments etc. It is much cheaper than the “Go” (although I like that one too). As far as lights etc, you are right, someone already has done it! Expensive at $150-200, But similar/smaller ones can be $30-40, but sometimes it’s nice to have extra good quality. Did you get your kit from etrailer? I’ve heard of kits that don’t have to splice into the wires, they clamp over them or something… was that the type of kit you installed? That Home Depot unit is certainly a lot cheaper than the Go Easy. Thanks also for the note on the camping chairs etc – so you’ve done some car camping in your 3 then I take it? P.S. Here’s some photos of my hitch installation. Hmm I’m not a member of Model3OwnersClub, so I can’t view them full size. So far I’ve only registered on TeslaMotorsClub… do you go on both? Do you get info off M3OC that you can’t get off TMC? Maybe I’ll register there too. Thanks for adding your info Colin! RE: wiring harness: that came with my hitch – this was part of their “towing package”. Yes, it is the type where you clamp onto existing wires. I had to run a line for power all the way to the 12v battery near the trunk. That was the most challenging step of the entire installation. That, and deciding exactly which wires to clamp onto – but that was made much easier after I got a volt meter (as they say you should). RE: Camping in the Model 3: No, not yet, just hikes and many summer trips to a cabin. But, I thought those chairs were so cool, and seemed “made” for the model 3. In the summer I preferred by MEC chair over a standard zero-gravity chair at the cabin. RE: M3 owners club vs. TMC. They are very similar – I signed up to both, mainly to keep track of when the M3 was coming to Canada during my waiting for the car back in the Spring. ALSO: I forgot to say (and you’ve probably already looked into this as you seem on top of tracking the energy use with and without the roof rack), but I did notice a big “hit” to my energy needs in these colder months – and you – only receiving your car in the coldest time of the year might be concerned about the reduced range. In the summer I use 155 Wh/km to estimate trips (using “A Better Route Planner” website) and I’ve found that in winter going over mountain passes like the Coquihalla, I am better (safer) to use 220 Wh/km (this is with a fully loaded car and family of 4). We have a chair of a similar type to that one, but my wife finds it cuts off circulation in her legs a bit – she thought the model you linked looked a bit different. When we come through Vancouver or Kelowna this year I’ll have to check it out in the store. I signed up for M3 Owner’s Club tonight – thanks for the photos. Sure looks like a process! I’ll build some ramps like that to get the car off the ground a bit as well. Probably should have done that for installing my Leaf hitch and saved myself some grief! Regarding consumption… I’m certainly hoping for better in the summer… I’m using 190 Wh/km in ABRP (with roof pod) and planned out my trip to Vernon for nordic midget champs Family Day weekend – a full charge gets me to Kelowna, but on the way back, due to the elevation difference between Kelowna and Nelson, I’ll either have to drive slower, or stop for 1 hour in Christina Lake for a top-up on a destination charger (Lisa’s Bistro at the visitor centre is a pretty nice stop though… so not a great hardship!) The other option is to head north from Vernon and around via Revelstoke… which we might do anyways just for a change of scenery (and maybe a dip in the hotsprings). Minor correction: I meant to say I had to run a power line to the 12v battery near the “frunk” (not trunk – darn autocorrect). 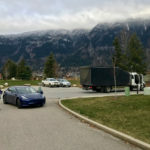 I am keen to see the superchargers arrive in Osoyoos and Grand Forks. That should be good for you too. My wife is from Nelson (but moved away when she was just 7 years old) and we love Nelson. I can’t wait to be able to Supercharge my way there as easily as I go from Penticton to Vancouver now. I am pretty sure I can make it all the way from Vancouver to Penticton with zero charging along the way – but we have so far always stopped – even if just for 5-10 min in Hope or Merrit. One more question! I just watched the video on the Stealth rack website, and they show the latching mechanism for the receiver or the ball hitch and how to switch between the two… during the video they showed the bumper “removed” to put the key in to unlock the latch to be able to swap attachments… I’m imagining they did this to show what is happening more clearly and that in actual conditions you can swap attachments without too much trouble? Whoah that is much further! I’d be interested to know where you ran the cable through the car – popped off some trim to hide it? I’m so excited to do road trips in our car!! 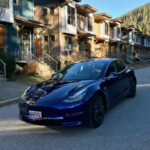 We have Vernon in February, up to Prince George in May, and over to Vancouver Island in June (unfortunately my free Supercharging runs out in early June, so I’ll be paying for the latter trip). I’m pretty amazed you can do Penticton to Van in one leg! I haven’t checked that out on ABRP yet. Regarding the wiring to a trailer connection to the battery in the model 3 – yes, definitely some parts were challenging. Most is actually easy running through a channel under the car – tucked into the underbody “covering”. The most tricky step was going from the forward wheel well up to the battery. But – it worked out – eventually. Re: switching between the two types of hitch attachments: yes, it’s quite easy. Not great if raining because definitely might get wet while reaching under to switch. Yes, we wil definitely send you a heads up when we next go to Nelson. Previous Previous post: So what are we getting? Next Next post: Roof Rack!